Instagrammer Amy Wilson of @thisstyle_rocks is no stranger to colour as her bright and eclectic bedroom goes to show. 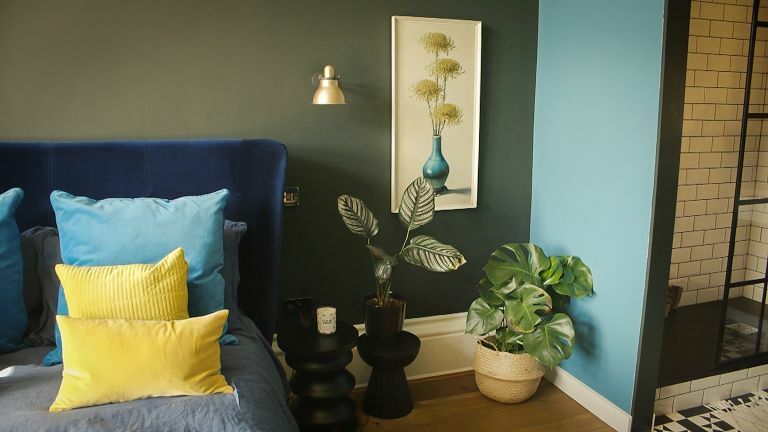 After creating a Pinterest board for inspiration, she has opted for a dramatic palette of dark green, blue and yellow. Here she tells Sian Astley how she developed the scheme for her bedroom, adding a boutique-hotel-style en suite inspired by a Crittall-look shower screen. Amy goes on to explain the vision for further additions to the bathroom and how a space evolves with time (and budget).